The Bill amends the Motor Vehicles Act, 1988 to address issues such as third party insurance, regulation of taxi aggregators, and road safety. Under the Act, the liability of the third party insurer for motor vehicle accidents is unlimited. The Bill caps the maximum liability for third party insurance in case of a motor accident at Rs 10 lakh in case of death and at five lakh rupees in case of grievous injury. The Bill provides for a Motor Vehicle Accident Fund which would provide compulsory insurance cover to all road users in India for certain types of accidents. The Bill defines taxi aggregators, guidelines for which will be determined by the central government. The Bill also provides for: (i) amending the existing categories of driver licensing, (ii) recall of vehicles in case of defects, (iii) protection of good samaritans from any civil or criminal action, and (iv) increase of penalties for several offences under the 1988 Act. The Bill caps the maximum liability for third party insurance, but does not cap the compensation amount that courts can award. In cases where courts award compensation higher than the maximum liability amount, it is unclear who will pay the remaining amount. Under the Act, compensation for hit and run victims comes from a Solatium Fund. The Bill creates a new Motor Vehicle Accident Fund in addition. With a Fund already existing to provide compensation for hit and run accidents, the purpose of the new Accident Fund is unclear. State governments will issue licenses to taxi aggregators as per central government guidelines. Currently, state governments determine guidelines for plying of taxis. There could be cases where state taxi guidelines are at variance with the central guidelines on aggregators. While the penalties for contravening provisions of the proposed scheme on interim relief to accident victims are specified in the Bill, the offences that would warrant such penalties have not been specified. It may be argued that imposing penalties without knowing the nature of the offences is unreasonable. The Bill does not address several issues around road safety that have been highlighted by other committees such as: (i) creating road safety agencies, and (ii) improving road design and engineering. In the last few years, with growing urbanisation and rising incomes, the number of motor vehicles in India has been increasing steadily. The number of registered motor vehicles in India grew by 123% between 2005 and 2013. Between 2005 and 2015, the number of road accidents increased by 14%, and road accident fatalities increased by 54%. During the same period, the road network grew by 44%. An increase in the number of vehicles on roads, along with the absence of a coordinated policy to control the problem has been attributed to an increase in the number of road accidents.2 With the number of road accidents increasing, the Ministry of Road Transport and Highways appointed the Committee on Road Safety in 2007 (Chair: Mr. S. Sundar) to examine the magnitude of road traffic injuries and fatalities. The Committee recommended setting up road safety authorities (at both national and state levels). In April 2016, the central government constituted a group of state transport ministers (Chair: Mr. Yunus Khan, Minister for Transport, Rajasthan) to recommend reforms for the road transport sector. The group recommended that the Motor Vehicles Act, 1988 be amended to address urgent issues related to road safety. The Motor Vehicles (Amendment) Bill, 2016 was introduced in Lok Sabha on August 9, 2016 by the Minister of Road Transport and Highways, Mr. Nitin Gadkari. The Bill seeks to amend the Motor Vehicles Act, 1988. The Motor Vehicles Act, 1988 is the primary central legislation that regulates the licensing and registration of motor vehicles, and drivers. The Bill seeks to address various issues such as road safety, third party insurance, regulation of taxi aggregators, recall of unsafe vehicles, and compensation for victims in case of road accidents. Driving licenses: Under the 1988 Act, a driving license is valid for a period of 20 years, or till the person attains the age of 50 years, whichever is earlier. After the age of 50, the license is valid for a period of five years. The Bill amends this to create several categories for the validity of licenses. If the person applying for the license is: (i) below 30 years, his license will be valid till he turns 40 years; (ii) between 30 and 50 years, his license will be valid for a period of 10 years; (iii) between 50 and 55 years, his license will be valid till he turns 60 years; (iv) above the age of 55 years, his license will be valid for a period of five years. Aggregator licenses: The Bill defines an aggregator as a digital intermediary or market place. The aggregator’s services may be used by a passenger to connect with a driver for transportation purposes. State governments will grant licenses to the aggregators based on the guidelines framed by the central government. The aggregators will also be required to comply with the Information Technology Act, 2000. Recall of vehicles: The Bill allows the central government to order for the recall of motor vehicles if a defect in the vehicle (i) may cause damage to the environment, or (ii) may cause damage to the driver, or (iii) may cause damage to other road users, or (iv) is reported to the central government. The manufacturer will have to (i) reimburse the buyers for the full cost of the vehicle, or (ii) replace the defective vehicle with another vehicle with similar or better specifications. Protection of good samaritans: The Bill defines a good samaritan as a person who renders emergency medical or non-medical assistance to a victim at the scene of an accident. The assistance must have been (i) in good faith, (ii) voluntary, and (iii) without the expectation of any reward. Such a person will not be liable for any civil or criminal action for any injury to or death of an accident victim. Electronic services: The Bill provides for the computerization of certain services. These include: (i) issue or grant of licenses or permits, (ii) filing of forms or applications (such as for licenses and registration), (iii) receipt of money (such as fines), and (iv) change of address. The Bill mandates state governments to ensure the electronic monitoring and enforcement of road safety on national highways, state highways, and urban roads. The central government will make rules for such monitoring. Penalties: The Bill increases penalties for several offences under the Act. For example, the maximum penalty for driving under the influence of alcohol or drugs has been increased from Rs 2,000 to Rs 10,000. If a motor vehicle manufacturer fails to comply with manufacturing or maintenance standards of motor vehicles, the penalty may be a fine of up to Rs 100 crore, or imprisonment of up to one year, or both. Compensation and insurance: The Bill also modifies the compensation and insurance provisions in case of motor vehicle accidents. These are illustrated in Table 1. Insurance company has to cover the entire amount of liability incurred as decided by the courts. Insurance company will be liable for a payment of up to Rs 10 lakh in case of death and up to Rs five lakh in case of grievous injury. Cashless treatment for road accident victims during golden hour. Golden hour: Time period of up to an hour following a traumatic injury, during which the likelihood of preventing death through prompt medical care is the highest. Compensation has not been specified. Central government may make schemes for providing such interim relief. (iii) any other source as prescribed the central government. Compensation in case of grievous injury where no person can be held liable for the accident. Central government will prescribe the maximum liability in each case. Sources: The Motor Vehicles Act, 1988; The Motor Vehicles (Amendment) Bill, 2016; PRS. Third party insurance is the liability purchased from an insurer (insurance company) by person A (insured party) to protect himself against claims from person B (third party), in the event of death, injury, or damage to property. Under the 1988 Act, third party insurance is compulsory for all motor vehicles and the liability of the third party insurer is unlimited. This means that the insurer has to cover the entire amount of the liability incurred (compensation), as decided by the courts. Currently, compensation amounts are calculated by courts on the basis of several factors such as age, earning capability of the victim, and may go up to several crore rupees. The Bill caps the maximum liability for third party insurance in case of a motor accident at Rs 10 lakh in case of death and at five lakh rupees in case of grievous injury. This implies that the insurance company is liable to pay only up to these specified amounts. However, the Bill does not cap the compensation amount to be decided by the courts. If courts award compensation amounts higher than the maximum liability prescribed under the Bill, it is unclear who will pay the remaining amount. Possible scenarios that may arise are presented in Table 2 below. Case 1: Insurer pays the victim’s heir/ representative the entire compensation amount as decided by the court. Insurance company recovers the additional amount from the insured party (vehicle owner). It may be cumbersome for insurance companies to recover the additional amount from individuals. In such cases, if insurance companies have to continue paying amounts higher than the maximum liability, it defeats the purpose of capping liability. Case 2: Insurer pays only the maximum liability amount i.e., Rs 10 lakh. Owner of the motor vehicle directly pays the remaining amount to the victim’s heirs/ representatives. If the motor vehicle owner does not have the financial capacity to pay the additional compensation amount, the victim may not get full compensation, as awarded by the courts. This would defeat the intent of third party insurance which is to ensure that victims get compensated in case of an accident. 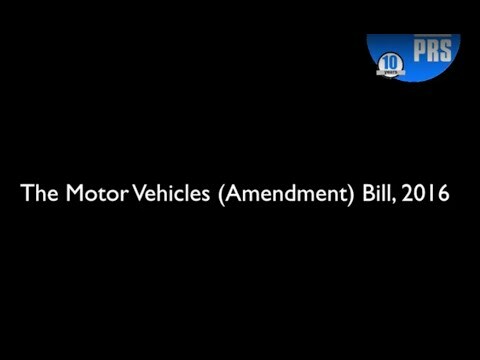 Sources: The Motor Vehicle (Amendment) Bill, 2016; PRS. Currently with unlimited liability, and compensation amounts increasing in the recent years, insurance companies have been reporting losses in the third party insurance business. In response, insurance premiums are being increased regularly. For the year 2016-17, Insurance Regulatory and Development Authority proposed to increase the premium for four wheeler vehicles by 50% to 83% over the earlier rates (depending on engine capacity). Setting a cap on the insurer’s liability may help limit such increases in the motor accident insurance premiums in the future. The Standing Committee examining the 2016 Bill recommended deleting the provision relating to capping of liability. Note that other transport laws in India provide for caps on the compensation amount in case of death or injury. For example, under the Carriage by Air Act, 1972, the limits in case of death or bodily injury is SDR 113,100 (about Rs 1.02 crore based on the exchange rate on March 3, 2017). The Railway Accidents and Untoward Incidents (Compensation) Rules, 1990 specifies the compensation amount at four lakh rupees in case of death, and between Rs 32,000 and four lakh rupees in case of an injury (depending on the type of injury). Some countries such as the UK, cap liability for third party insurance, and allow motor vehicle owners to buy additional insurance at an additional premium. The Bill requires central government to constitute a Motor Vehicle Accident Fund which would provide compulsory insurance cover to all road users in India for: (i) treatment of a person who has been grievously hurt in an accident, till he is stabilized; and (ii) compensation in case of death or grievous injury where no person can be held liable for the accident. The central government will determine the limits of liability in such cases. The Fund will be credited with: (i) a cess or tax as approved by the central government, or (ii) a grant or loan made by the central government, or (iii) any other source as prescribed the central government. Currently, the 1988 Act provides for a Solatium Fund to provide compensation to hit and run victims. The new Motor Vehicle Accident Fund also provides for compensation for hit and run accidents, in addition to other accident cases. With the Solatium Fund already existing, the purpose of the new Motor Vehicle Accident Fund with regard to hit and run cases is unclear. For example, there is no clarity on whether accident victims can seek compensation (for a particular hit and run case) from either or both the funds. Further, if the proposed Motor Vehicle Accident Fund is funded through a cess or a tax, motor vehicle owners may have to pay taxes in addition to paying the compulsory third party insurance premiums. The Bill defines aggregators as digital intermediaries or market places which can be used by passengers to connect with a driver for transportation purposes (taxi services). State governments will issue licenses to aggregators in conformity with guidelines issued by the central government. However, the Bill does not specify what these guidelines will cover. Currently, all taxi permits (including aggregators, radio taxis) are issued by state transport authorities. The 1988 Act allows the state transport authorities to attach additional conditions to these permits, such as the rate of fare, the maximum number of passengers, the requirement of meters in taxis, etc. In accordance with this, states have framed their own guidelines for taxi operations. For example, Delhi has the Delhi Radio Taxi Scheme, 2006, Karnataka has implemented the Karnataka Motor Vehicles Rules, 1989, etc., Recently, Maharashtra released the draft Maharashtra State Taxis Rules, 2016. These Rules provide guidelines on various aspects of aggregator services including operational infrastructure, vehicle profile, driver’s profile, grant of licenses, and taxi fare. The Bill allows the central government to make a scheme for providing interim relief to claimants seeking compensation under third party insurance for motor vehicle accidents. The scheme will also provide for the procedure to recover funds disbursed under such scheme from the owner of the motor vehicle involved in the accident. Any contravention of any provision of the scheme may be punishable with imprisonment of up to two years, or with a fine between Rs 25,000 and five lakh rupees. While the Bill specifies penalties for contravening provisions of this scheme, it does not specify the offences that would warrant such penalties. This implies that the government through a notification for the scheme may specify the offences which would carry these penalties. The question is whether it is appropriate to delegate the function of specifying offences to the executive. The Bill mandates state governments to ensure electronic monitoring and enforcement of road safety on National Highways, State Highways, and urban roads as per guidelines framed by the central government. It is unclear who will bear the cost of implementing such safety measures. According to the Statement of Objects and Reasons, the Bill seeks to address issues related to road safety. While the Bill addresses several of these issues, various experts have highlighted other concerns with regard to road safety. Some of these are highlighted below. In India, the National Road Safety Council, headed by the Minister of Road Transport and Highways, is the apex advisory body on road safety. The Transport Division within the Ministry of Road Transport and Highways looks at the safe movement of vehicles on roads and safety awareness. In India, about 77% of the accidents are reported to have been caused due to the driver’s fault. Other factors responsible for road accidents include fault of drivers of other vehicles, defect in condition of motor vehicle, fault of pedestrian, weather conditions, faulty road engineering, etc. The Standing Committee on Transport had observed that the majority of accidents being caused due to driver’s fault may be erroneous. This could be due to wrong or under reporting of such accidents. The Ministry of Road Transport and Highways adopted a standardised accident recording form in February 2017. The form will capture information such as: (i) accident identification/location, (ii) road conditions such as gradient, potholes, (iii) details of the vehicles involved, (iv) victim details, and (v) traffic violations.
. This Brief has been written on the basis of the Motor Vehicle (Amendment) Bill, 2016 which was introduced in Lok Sabha on August 9, 2016. The Bill was referred to the Standing Committee on Transport, Tourism, and Culture on August 16, 2016.
. “Volume 3, Chapter 2, Roads and Road Transport”, India Transport Report: Moving India to 2032, National Transport Development Policy Committee, June 17, 2014, http://planningcommission.nic.in/sectors/NTDPC/volume3_p1/roads_v3_p1.pdf.
. Table No 20.1: Number of motor vehicles registered in India, Statistical Yearbook of India 2016, Ministry of Statistics and Programme Implementation.
. Road Accidents in India 2015, Ministry of Road Transport and Highways, May 2015, http://morth.nic.in/showfile.asp?lid=2143.
. Basic Road Statistics 2014-15, Ministry of Road Transport and Highways http://morth.nic.in/showfile.asp?lid=2445.
. Report of the Committee on Road Safety and Management, February 2007, http://morth-roadsafety.nic.in//admnis/admin/showimg.aspx?ID=29.
. Second Schedule to the Motor Vehicles Act, 1988.
. “Skandia Insurance Co. Ltd. vs. Kokila Chandravadan & Ors.”, Supreme Court of India, April 1, 1987, http://judis.nic.in/supremecourt/imgs1.aspx?filename=8760.
. The incurred claims ratio for the motor insurance business ranged between 84% and 103% between 2006-07 and 2014-15. The claims ratio for private motor insurance companies has increased from 64% in 2006-07 to 82% in 2014-15. Handbook on Indian Insurance Statistics for years 2006-07 to 2014-15, Insurance Regulatory and Development Authority of India.
. Annexure II: Proposed premium for the FY 2016-17, Insurance Regulatory and Development Authority of India, September 21, 2016.
. 243rd Report: The Motor Vehicles (Amendment) Bill, 2016, Standing Committee on Transport, Tourism and Culture, February 8, 2017, http://www.prsindia.org/uploads/media/Motor%20Vehicles,%202016/SCR-%20Motor%20Vehicles%20Bill,%202016.pdf.
. The Carriage by Air Act, 1972, Ministry of Civil Aviation, http://dgca.nic.in/nat_conv/The%20Carriage%20by%20Air%20Act%20and%20Amendment%202009.pdf.
. The Railway Accidents and Untoward Incidents (Compensation) Rules, 1990, http://www.indianrailways.gov.in/railwayboard/uploads/codesmanual/IRCTCD/TrafficCommericalDepartmentAppendix4.htm.
. Part VI: Third Party Liabilities, Road Traffic Act, 1988, http://www.legislation.gov.uk/ukpga/1988/52/part/VI.
. Radio Taxi Scheme, 2006, Transport Department, Government of NCT of Delhi, http://www.delhi.gov.in/DoIT/DoIT_Transport/trrs31.pdf.
. The Karnataka Motor Vehicle Rules, 1989, Transport Department, Government of Karnataka, http://transport.karnataka.gov.in/uploads/notice/Revised_M_V.pdf.
. Notification: Draft Rules - Maharashtra City Taxi Rules, 2016, Motor Vehicle Department, Maharashtra, October 2016, http://www.mahatranscom.in/pdf/Aggregator%20Rules-15_10_2016.pdf.
. Entry 35 of the Concurrent List of the Constitution.
. Road accidents in India 2015, Transport Research Wing, Ministry of Road Transport and Highways, May 23, 2016, http://morth.nic.in/showfile.asp?lid=2143.
. “220th Report: Demands for Grants (2015-16) of Ministry of Road Transport and Highways”, Standing Committee on Transport, Tourism and Culture, April 28, 2015.
. “Ministry of Road Transport’s New Format for Reporting Accidents”, Press Information Bureau, Ministry of Road Transport and Highways, February 21, 2017.